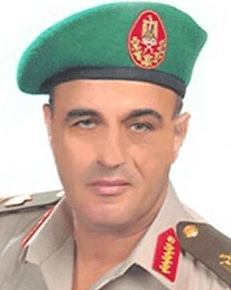 Major General Muhammad Abdellah is the Commander of the Third Field Army, which is headquartered in Suez and operates in South Sinai. Abdellah was born in Alexandria in 1958, and is a graduate of the Military Academy, though sources differ on his graduation date; some say 1976 and others say 1978. He progressed through the armored service, studying tactics in both the United States and Germany and participating in the First Gulf War. Abdellah served as the Egyptian military attaché to Germany, and studied at the U.S. Army’s Command and General Staff College in Fort Leavenworth, Kansas. He was Chief of Staff for the Western Military Zone before being appointed to the same position for the Third Field Army. When Lt. Gen. Osama Askar, former Commander of the Third Field Army, was appointed to lead the Unified Command for the Area East of the Canal and for Counter-Terrorism, Abdellah was promoted to take his place in February 2015. Information about Abdellah’s participation in specific operations is not widely available. News reports mentioning his name during his time as Chief of Staff for the Third Army are limited to ceremonial events. Abdellah was present for the return of Egyptian truck drivers who had been kidnapped in Libya in October 2013, when he was Chief of Staff for the Western Military Zone, but there are no reports of him being involved in securing their release.